Where’s the heat? 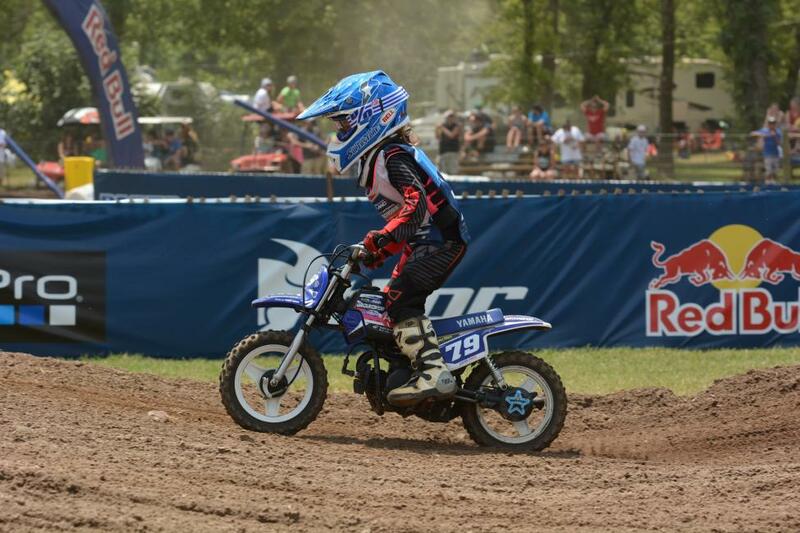 A day of racing is complete at the 33rd annual Rocky Mountain ATV MC AMA Amateur National Motocross Championship at Loretta Lynn Ranch presented by Amsoil. All the regular elements of the weeklong event were in play today, except the typical heat and humidity. The forecast says temperatures will hover in the mid 80s throughout, a huge difference from the triple digits we normally see. But is this a weather report or a race report? Let’s give you some highlights. 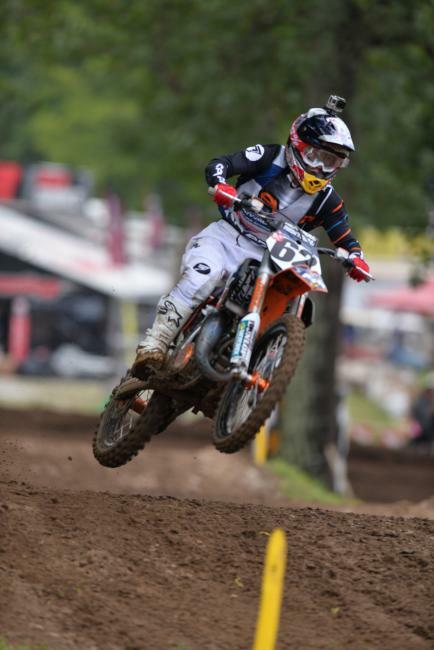 We know you’ll be reading these reports as a cheat sheet to see who will make an impact in the pros at Unadilla. The answer for now is RJ Hampshire. 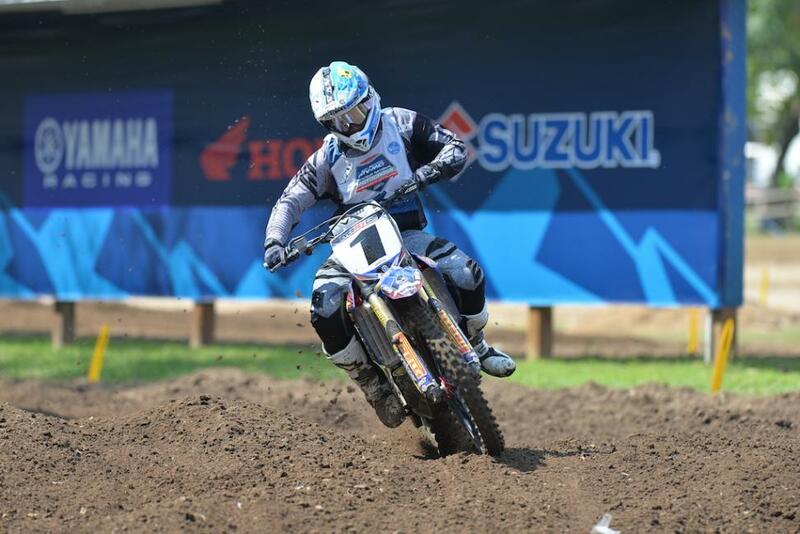 The Floridian on the powerful Amsoil Factory Connection Honda team (you know them as GEICO Honda on the pro side) swept his two motos, one in Open Pro Sport and the other in the stacked-to-the-gills 250 A class. In Open Pro Sport, RJ had the 41st gate pick (which is selected at random) yet still got a decent start, and found himself in the lead almost immediately. He outpaced Yamalube Star Yamaha’s Aaron Plessinger the rest of the way. The 250 A moto was ridiculous. Daniel Baker grabbed the holeshot and led for awhile on his KTM, while Hampshire and Plessinger worked their way forward. Jordan Smith, another big name and Hampshire’s teammate, worked his way into second, but he’s dealing with an ankle injury and couldn’t quite hold the Hampshire/Plessinger train back. The duo busted past Baker to get into the lead and set a blistering pace, with Plessinger keeping Hampshire honest this time….until his bike suddenly locked up on the face of a jump. He endoed badly but got up and ran off the side of the track, although later was seen nursing a foot injury. A lap later, fighting for a podium finish, Darian Saneyai crashed and possibly broke his collarbone. Somehow, Monster Energy Kawasaki Team Green’s Chris Alldredge, from way, way back, ended up salvaging second. At the intermediate level, Mitchell Harrison also has a 2-0 record through two motos, one in Schoolboy 2 and another in 250 B. He was able to run and hide with holeshots both times, and held up strong under pressure from Alexander Frye and Tristan Charboneau. Frye would later crash, letting Charboneau take second. 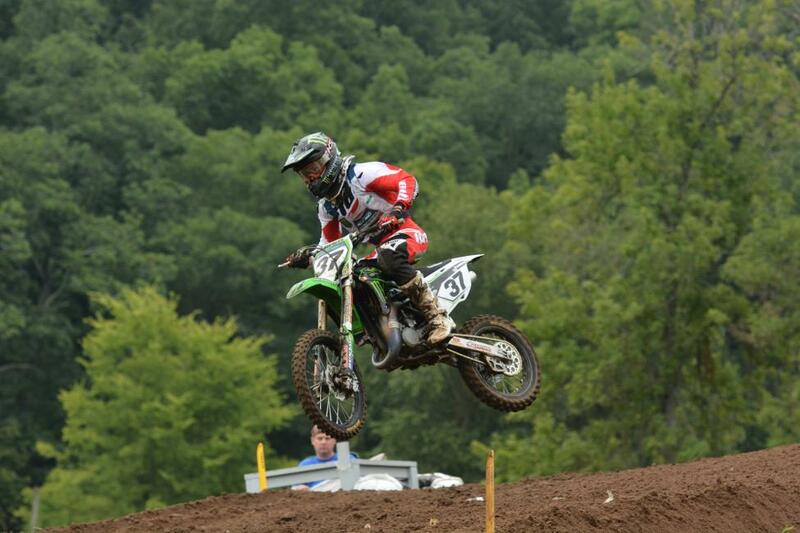 The top minicycle rider of the day was Team Green’s Garrett Marchbanks, who won both the Mini Sr. and Mini Sr. 1 classes. 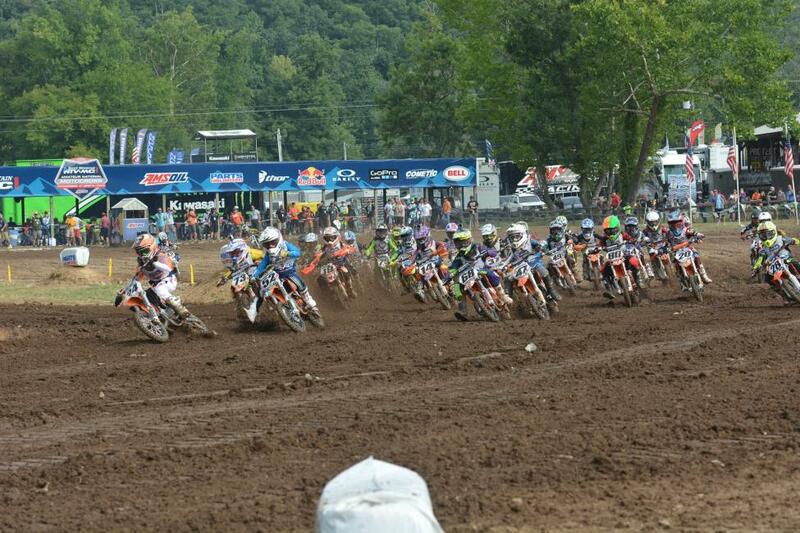 And one of the Supermini classes hosted the best battle of the day. Mitchell Falk and Tanner Stack led for awhile, then Austin Forkner came from behind to get the lead, only to crash, handing the lead to Chase Sexton, who also crashed earlier, only for Sexton to get cross rutted on the last lap and open the door for Sean Cantrell to steal the moto win. In the age classes, Ricky Renner dominated the 25+ class with a huge lead, and Trampas Parker and John Grewe rekindled their battle from last year in 45+, with Parker edging ahead for the win. Earl May outdueled Rodney Smith in the 50 + class. Chad Murphy won the 30 B/C class. Mackenzie Tricker won a big battle with Kaitlyn Morrow to take the Womens first moto, these two battled the whole way last year, too. Hannah Hodges continued her run with a dominant performance in the Girls (12-16) class, taking moto one to match her 1-1-1 performance from last year. Jazzmyn Canfield was hoping to do the exact same thing in the Girls (9-13) class when she led early, but she crashed and fell back. Jordan Jarvis scored a solid moto win. 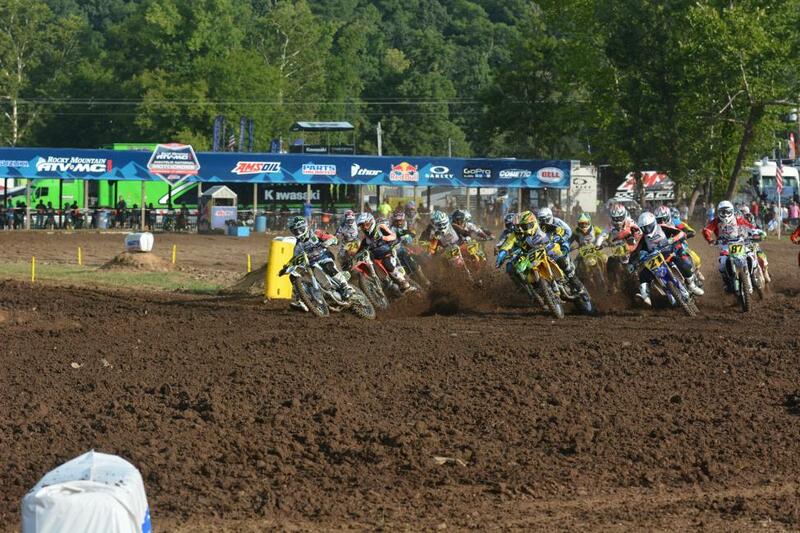 A word of caution for these first motos: With the random gate picks, some of the fastest riders end up with bad starts. Things will heat up in the second motos--well, except for the weather. 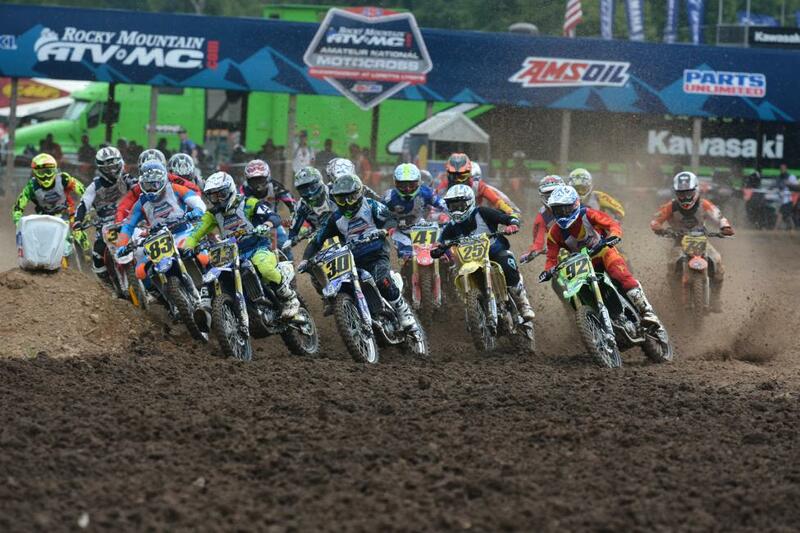 The 33rd Annual Rocky Mountain ATV/MC AMA Amateur National Motocross Championship presented by Amsoil rolled into its second set of motos today, and once again with ideal race conditions. Seriously, the weather is crazy good here compared to the mega heat we usually deal with, it's making for a totally different experience. Oh wait, race report not weather report, right? Factory Connection/Amsoil Honda’s RJ Hampshire continues to kill it, now capturing three consecutive moto wins between the Open Pro Sport and 250 A classes. After sweeping both of Tuesday’s opening motos, Hampshire kept his streak alive with another win in the Open Pro Sport division. It’s not over until it’s over, though, especially with the consistency and speed of Monster Energy/Team Green Kawasaki’s Colt Nichols and bLU cRu/Yamaha’s Aaron Plessinger, who have traded positions on the podium through the first two motos of the Open Pro Sport class. Monster Energy/Team Green Kawasaki’s Chris Alldredge established himself as another top contender in the A division, carrying two podium finishes into the third day of racing. 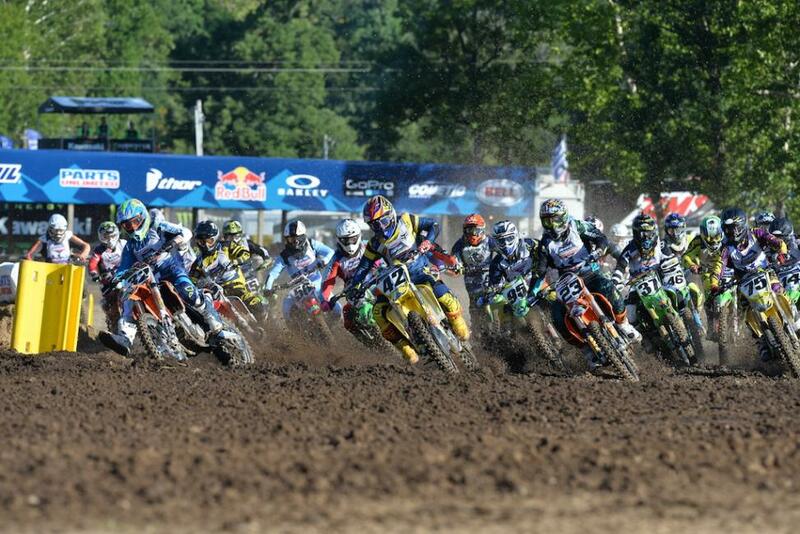 In Moto 1 of the 450 A Class, Alldredge grabbed the Bell Holeshot Award and led from start to finish. Meanwhile, a battle ensued for second place between Daniel Baker and Chandler Lindsay. Baker held on for second, with a hard charging Luke Renzland coming back from a 16th place start to secure the last podium spot. Lindsay finished fourth. In the intermediate division, Tristan Charboneau captured his first moto win of the week in 450 B after grabbing a commanding holeshot over the field. The real battle took place behind the leader, though, with Timmy Badour, Salvatore Colangelo, Jamison Duclos and Mason Maahs. Colangelo secured the second place spot, with Badour landing the final podium position. After a big crash on Tuesday, Alexander Frye came out swinging in 250 B Limited Moto 1 to capture the Bell Holeshot Award and the early lead. It wasn’t long before Frye went down again, and Bradley Taft moved into the lead position with Chase Bell close behind. Ryan Surratt caught up to Bell and the duo battled it out until Surratt made his move to take over second and Frye followed suit. In a chaotic ending, it was Taft who took the win, followed by Surratt and Frye. There's chaos in the Schoolboy 2 class (for 250Fs) as Mitchell Harrison, who took two moto wins yesterday, is now 1-DNF in the class after popping his knee out. Rookie White is now 8-1 in moto scores after today's win, with Mark Worth sitting on 3-2 and Jake Masterpool holding a 12-3, while racing a 125 against the 250Fs. He said he's doing it because he likes it. The minicycle classes once again showcased great battles, beginning with the opening moto of the Super Mini 2 (13-16) class. Big names such as Sean Cantrell, Austin Forkner and Tanner Stack lined up for this one, along with several more heavy hitters. Cantrell took the early lead, with Kevin Moranz, Forkner, Joey Crown and Max Markolf close in tow. 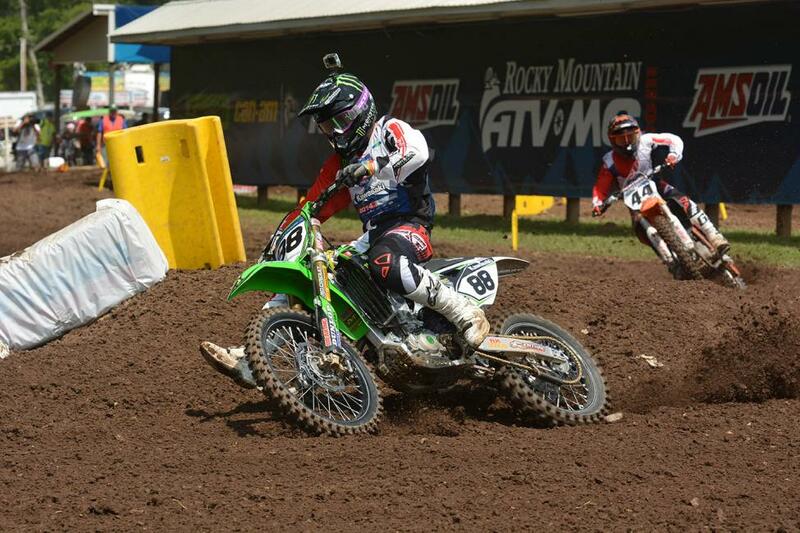 Forkner caught the rear of Cantrell and the duo went to battle for the lead spot. Toward the end, Forkner made his way around Cantrell for the lead and never looked back. In the 65 (7-11) class, it was Josh Varize who came out on top, with Jett Reynolds in the second place position and Maximus Vohland rounding out the top three. Racing will resume on Thursday, July 31 with the remainder of the Moto 2 schedule. Live streaming coverage continues on Thursday at 10:30 a.m. CT / 11:30 a.m. ET on RacerTV.com. For more information on the viewing times for the rest of the week, please click HERE. Archived coverage is now available from the first two days of racing on RacerTV.com, to view please click HERE. 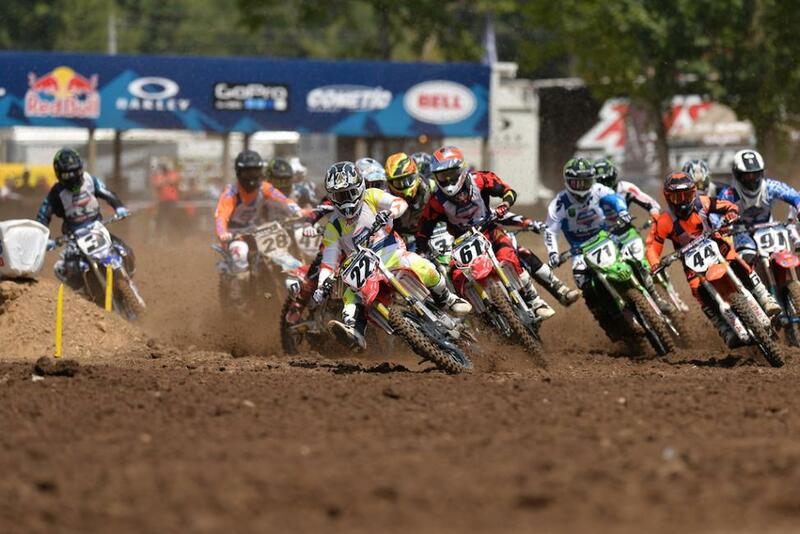 The second set of motos began to wind down Thursday afternoon from day three of the 33rd Annual Rocky Mountain ATV/MC AMA Amateur National Motocross Championship presented by AMSOIL. Each of the 36 National Championship classes had an opportunity to check out the track and get rid of first-race jitters as day three of racing focused solely on the title contenders that will soon be crowned. RJ Hampshire’s hot start to the week continued into Thursday aboard his Factory Connection/AMSOIL Honda. 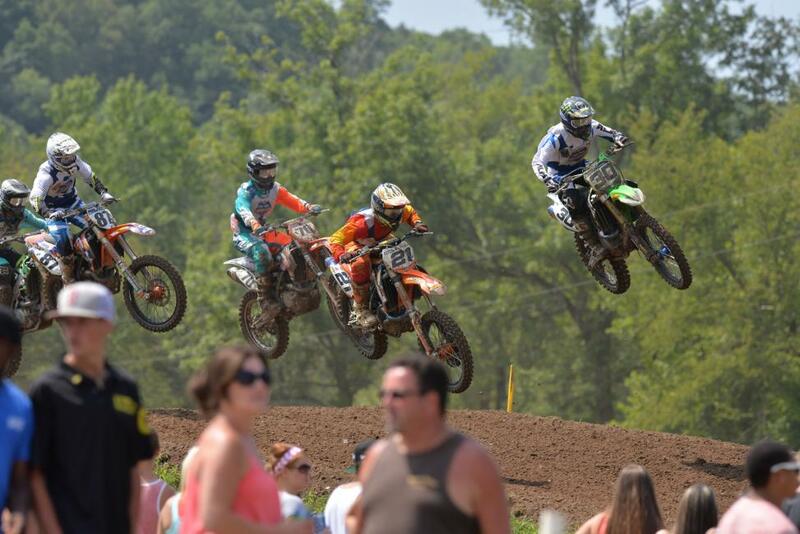 Entering today, Hampshire had a clean streak—winning every 250 A and Open Pro Sport moto. In Moto 2 of 250 A, Hampshire grabbed the Bell Helmet Holeshot and sprinted to an early lead over teammate Jordon Smith and Luke Renzland. With Hampshire leading, contenders Chris Alldredge of Monster Energy/Team Green Kawasaki and Yamaha/bLU cRU’s Aaron Plessinger were buried following a big pileup off the start. Renzland eventually worked his way past Smith for second and it was all over from there as Smith crashed and didn’t finish Moto 2. Hampshire went unchallenged on his way to another moto win, extending his streak to four in a row through the first four races. Renzland finished second, with Plessinger capping the podium. Hampshire leads the overall running (1-1) over Renzland (4-2) and Alldredge (2-8) with one moto remaining in the championship chase. 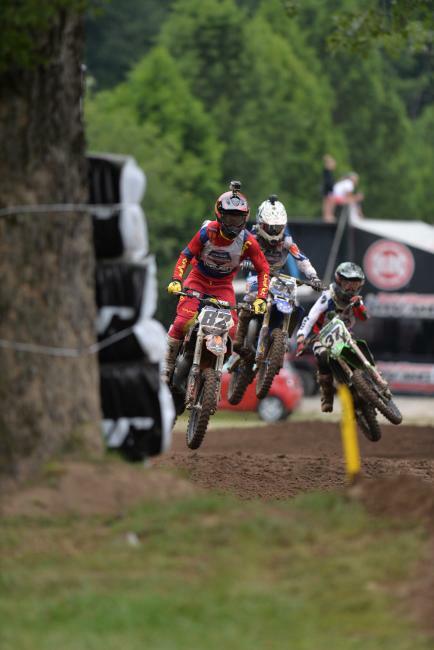 In 450 A, Chris Alldredge took the Bell Holeshot over Luke Renzland and teammate Nick Gaines. 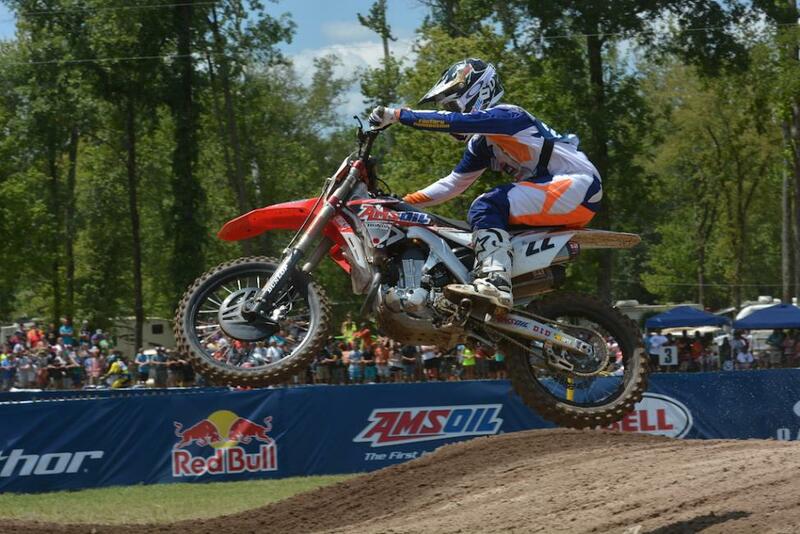 Renzland, the defending champion in 450 A, attacked quickly and made his way past for the lead. Alldredge would hold off Gaines for second. Renzland (3-1) enters the final moto leading over Alldredge (1-3) and Daniel Baker (2-4). Following a third place finish in Moto 1, Benny Bloss has climbed back into contention in 450 B Limited with a big moto win on Thursday. Moto 1 winner Lorenzo Locurcio held the lead early on but would soon give way to Bloss after a small crash. Bloss held on for the duration, where he now sits in second overall with moto scores of 3-1 with one moto to go. 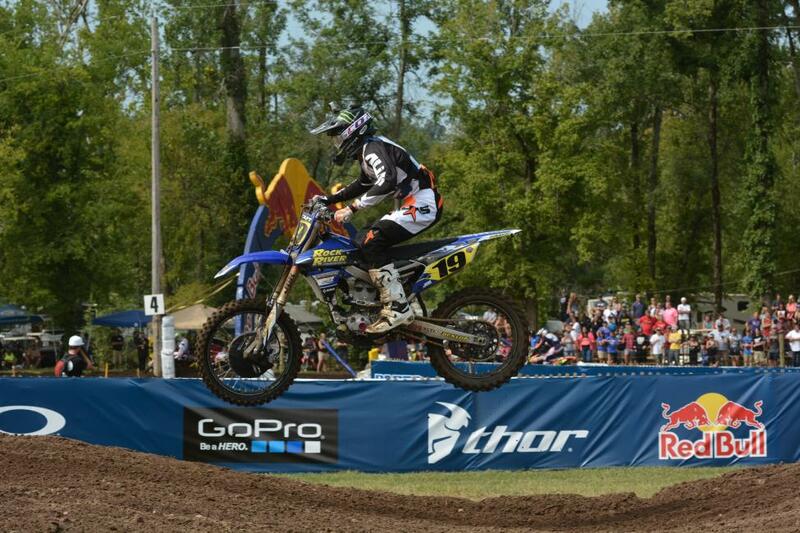 Locurcio finished second in Moto 1 and leads the class with 1-2 moto scores. Chase Marquier (2-4) holds third place following a fourth place finish on Thursday. Through two motos in the 250 B class, things are beginning to tighten up both on the track and in the standings. Out front early on was Mitchell Harrison but it wasn’t long before Harrison got pressure from Lorenzo Locurcio and Alexander Frye, as well as Chase Bell. Locurcio briefly took over the lead from Harrison but Tristan Charboneau quickly interjected himself into the mix. After launching past Frye, Charboneau got around Locurcio and held on for his first moto win of the week. 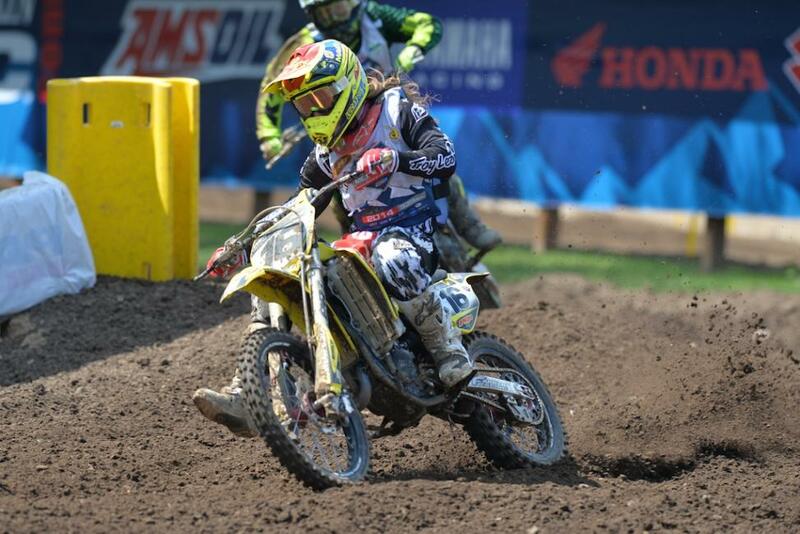 Harrison, the Moto 1 winner, fell back to fifth place. Frye came in second, with Locurcio rounding out the podium. Heading into the final moto, Charboneau leads with 2-1 moto scores over Locurcio with a score of 3-3. 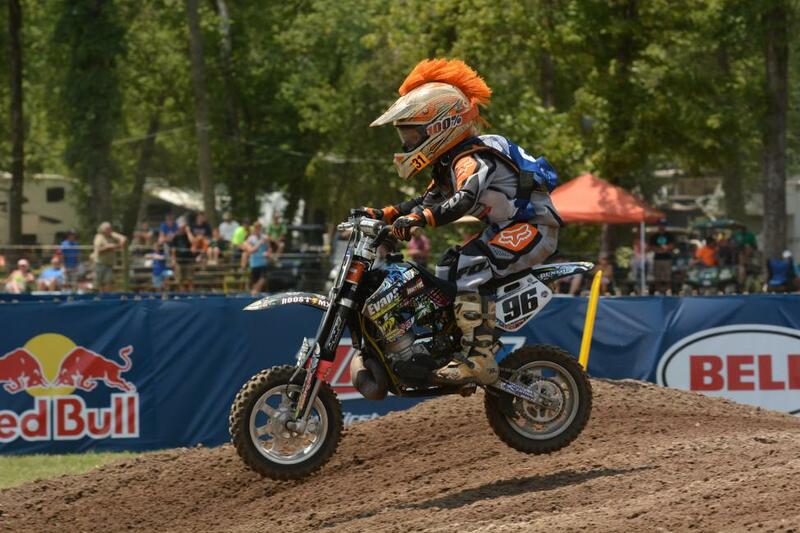 In Moto 2 of the Super Mini 1 (12-15) class, it was Mitchell Falk who led the field through the first turn. The Monster Energy Kawasaki/Team Green duo of Austin Forkner and Sean Cantrell trailed early on, with company from Chase Sexton and Max Markolf. Falk never faltered up top, but the battle for third came down to the wire with Forkner holding off Cantrell, Sexton and Markolf. After two motos, Cantrell (1-3) leads over Falk (5-1). 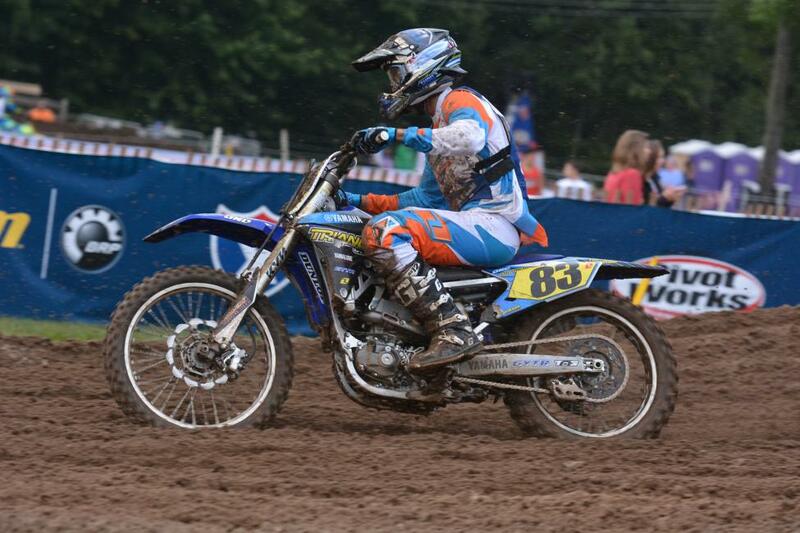 Stilez Robertson took another step closer to a 2014 title with his first win in the 85 (9-11) class. Through two motos, Robertson (2-1) holds a slight edge over Ethan Mann, who sits with a 3-2 moto score. 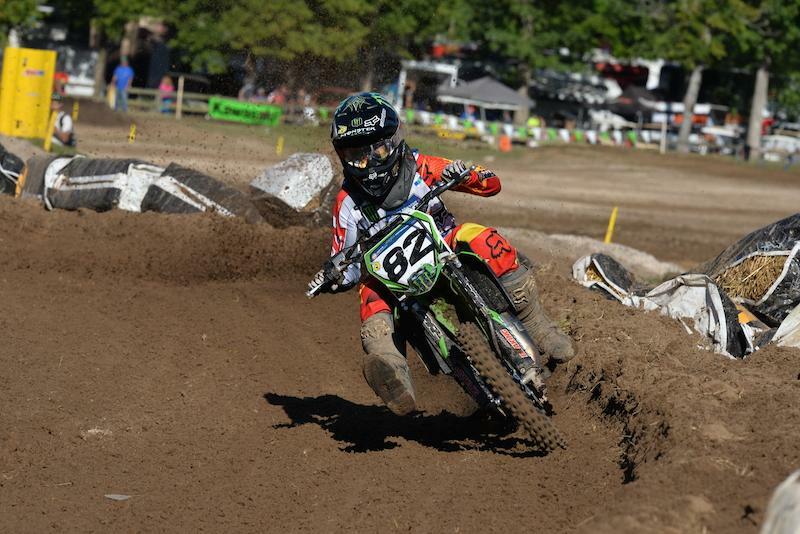 Robertson’s Kawasaki teammate Garrett Marchbanks continued his perfect week in Mini Sr. (12-13) with his second moto win over Jalek Swoll. In 51 (7-8) Limited, Nicholas Romano won his second consecutive moto and holds the advantage over Noah Geyer (4-3) heading into the third and final moto. 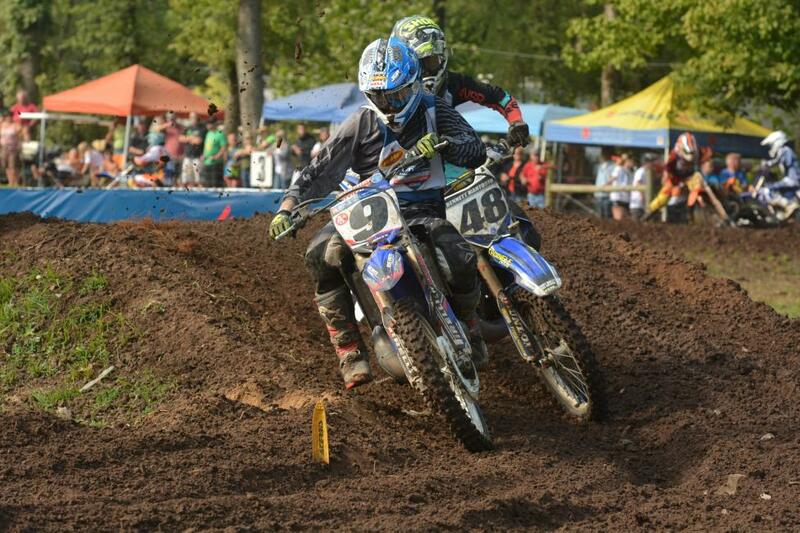 Jaden Palmer won Moto 2 of the 51 (4-6) Limited class, while Wyatt McGrath captured the 51 (4-6) Special Limited class. Aiden Eyler took the victory in 51 (4-6) Shaft Drive Limited. In Vet action, John Grewe evened the score with Trampas Parker in Senior (45+), as the duo trades off 1-2 finishes thus far. 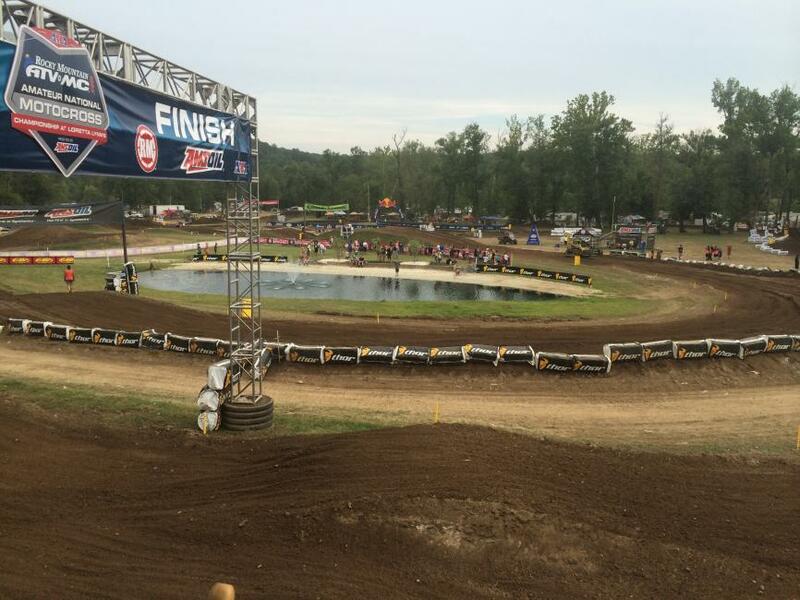 Both Parker and Grewe will enter the third and final moto in a winner-take-all scenario. In Masters (50+), Earl May captured his second consecutive race win, holding a lead over the consistent runner up of Rodney Smith (2-2). Kaitlyn Morrow is now tied with Mackenzie Tricker in Women (14+) as the highly competitive championship battle, where each rider holds a moto win, heads into the final moto on Saturday. In the Girls division, Hannah Hodges sealed the deal once again in the 12-16 division, where she remains undefeated heading into the final moto. It was yet another 1-1 sweep in the 9-13 division, topping Moto 2 runner up and reigning champion Jazzmyn Canfield. 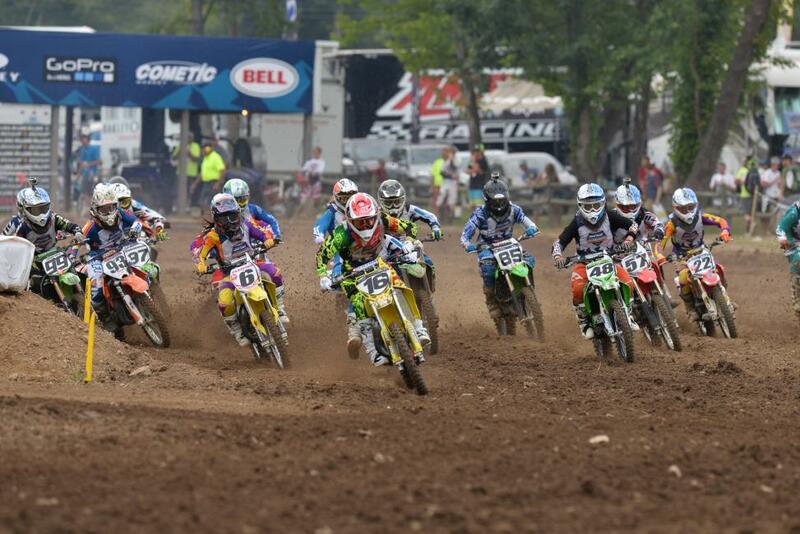 Racing will resume on Friday, Aug. 1 with the commencement of the third and final set of motos. Live streaming coverage begins Friday morning at 10:30 a.m. CT / 11:30 a.m. ET on RacerTV.com. For more information on the viewing times for the rest of the week, please click HERE.